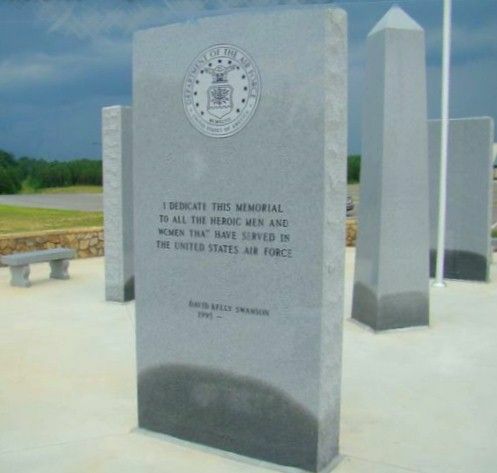 New in 2010, the Murray Veterans Memorial honors men and women who have honorably served in the military. Memorial bricks were sold to help finance the building of the park and the first of those bricks have been installed. The obelisks were furnished by a donor who wanted to remain anonymous. All of the flag-poles were donated by the Bobby T. Mosteller family. 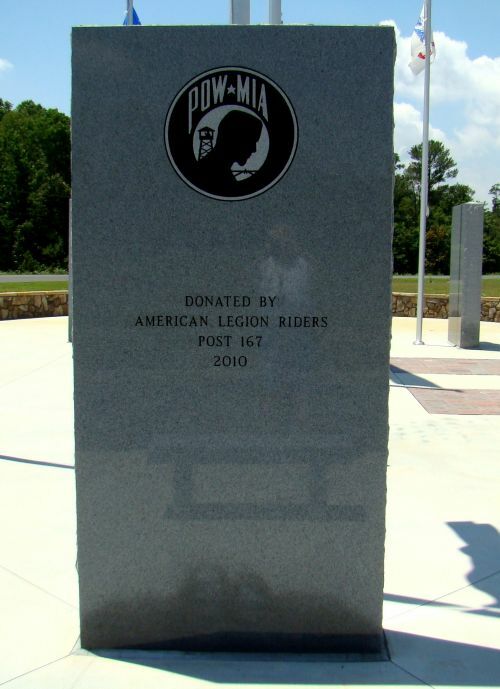 The POW-MIA monument was provided by American Legion Riders Post 167. The Army bench was donated by Steve Witherow. The Navy bench was donated by Ed Burger. The Marines bench was donated by Sons of the Confederacy. The Air Force bench was donated by the James C. Loughridge family. The Coast Guard bench was donated by Phyllis Fincher Parsons. Other monuments have captions with the photos indicating who donated them. Thanks to a volunteer, Robert G. Green, the museum now has a listing of what those first bricks reveal about Murray County veterans they honor. And, as additional bricks are placed in the park, the museum will update this list periodically. Robert also contributed the photographs of various memorials and monuments already in the newly opened park. Thanks! CARL B. TANKSLEY 2 LT INFANTRY U S ARMY 1942-1945 PURPLE HEART, CIB IN HONOR OF ALL WHO SERVED, THOSE WHO SACRIFICED LIFE AND LIMB, AND THE COMBAT INFANTRYMEN WHO LED THE WAY. Note: Bricks in this section are restricted to those honoring Murray County men who died while on active duty during war time. The listing of other men who either survived the wars or served during non-war years can be found immediately following this listing. The Walk of Murray's War Dead was dedicated May 26, 2012, with appropriate ceremony, including remarks from several speakers, live music, a 21-gun salute, the playing of taps, and the actual unveiling of the two new sections of commemorative bricks. This view of the entire Veterans Memorial Park, by Benny Huggins, shows how the Walk of Murray's War Dead fits into the total park. The Walk of Murray's War Dead occupies two sections of bricks stretching from the red and white wreath on the left, to the Georgia State flag at the extreme left of the photo. The larger section contains bricks honoring Murray men who died while serving in the Spanish-American War through the Vietnam War. Thankfully, no Murray men have died in the more recent conflicts. This grouping honors Murray men who died in Spanish-American War, World War I, World War II, the Korean War, and the Vietnam War. Photo by Benny Huggins. Because the concrete had not dried sufficiently to safely accept drilling and anchoring of screws, the protective rope could not be installed around this grouping before the dedication. These bricks are all in honor of Murray men who died while serving in the Confederate Army during the Civil War. Photo by Benny Huggins. The American Legion Post in Dalton provided both the 21-gun salute depicted in this photo by Benje Thomas, and the playing of Taps, which concluded the dedication program. The following named Murray men have bricks honoring their service and sacrifice in the Walk of Murray's War Dead. May All Rest in Peace! � Bobby Mosteller & Herman McDaniel 2007. Revised edition � Bobby Mosteller & Herman McDaniel 2008. ALL IN MURRAY COUNTY HONOR YOUR MEMORY AND APPRECIATE YOUR SACRIFICE. Please be aware that bricks have been installed for all of the Murray County men known to have died while serving in the Civil War, Spanish-American War, World War I, World War II, Korean War, and Vietnam War. Those names are in the preceding listing of bricks within The Walk of Murray's War Dead. Hamby, Thomas C, SGT, US Army, 1948 - 1950, 82nd Airborne Div.